Around 8,500 working class women in Glasgow made history on 23-24 October when they took industrial action. As BBC news commented, it was "one of the biggest ever strikes in the UK on the issue of equal pay". In truth, it was more like an uprising, in which the power of the working class was clearly demonstrated. 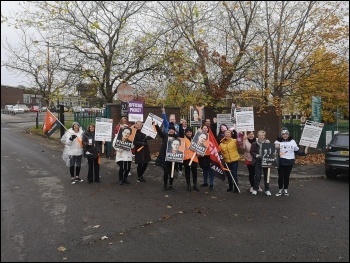 Picket lines were set up across hundreds of primary schools, nurseries, cleaning depots and council buildings. You did not have to walk very far to find a picket line or hear one! Later on, a colourful sea of 10,000 strikers, fellow trade unionists, and supporters, marched in a noisy and vibrant demo on the first strike day that shook the streets from Glasgow Green to George Square. Central to the mobilisation was the tremendous fighting capacity of low-paid women workers, who made up 90% of the strikers. Betrayed by the previous right-wing Labour council which presided over the pay inequality scandal for a decade - and the new Scottish National Party (SNP) council that promised a just resolution but has dragged its heels - working-class women had had enough. The strike reflected their pent-up anger but also the experience of the last decade of vicious capitalist austerity. As a striking marcher said: "We want fairness. I'm a single parent, struggling to support my family on £800 a month". After the pickets finished, a sea of strikers flooded Glasgow Green for the demonstration. Bus drivers let strikers travel free to Glasgow Green. The 75 bus from Castlemilk was seated almost entirely by strikers singing and chanting their way to the demonstration. There was mass support from the public. As the demonstration came into the city centre, shoppers applauded. 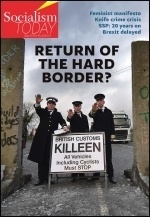 This was despite a barrage of anti-strike propaganda by the council leading up to the strike. Council management in Land and Environmental Services initially threatened to discipline any worker who did not work during the strike. But on the morning shift in a marvellous display of solidarity, all 600 refuse workers - almost all male - walked out in solidarity with the women picketing the depots. Some social workers, and some in the Glasgow Life arms-length organisation, also refused to cross picket lines and took solidarity action. The SNP falsely claimed that the trade unions are pawns of Scottish Labour, that the strike is only taking place due to Glasgow being a SNP council. Labour Party leader Jeremy Corbyn and Richard Leonard, Scottish Labour leader, did give welcome support to the strike. But they failed to denounce the previous Labour council's actions, which only lends weight to accusations of opportunism. Glasgow City Unison countered the SNP's claim by citing its militant history of 12 strikes for fair pay against the pay scheme, mainly when Labour was in power. The reason for this strike was the Court of Session judgement in August 2017 that ruled the Glasgow pay scheme unequal and unfair. The women gave the SNP a chance after the consultative ballot in the summer, but the council let them down in negotiations. Striking is the only way to press for a negotiated settlement. SNP council leader Susan Aitken poured petrol on a fire by suggesting that the strikers did not "understand the reasons" they were taking action. Disgracefully, council officers and "spokespersons" ran a scaremongering campaign targeting the home care strikers, publicly raising concerns that there would be fatalities and hounding the trade union over the issue of life and limb cover. The SNP administration and council officers also tried divide and rule. They called off negotiations with Unison and the GMB union as punishment for organising the strike. They would only negotiate with the Action 4 Equality lawyers and the non-striking Unite union. However, all the claimant organisations were united in rejecting this approach. Socialist Party Scotland has played a crucial role in this dispute in the leadership of Glasgow City Unison - whose members made up 5,500 of the 8,500 strikers. We have been building solidarity, including strike fund donations, over the last few weeks. 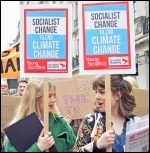 We distributed thousands of our strike leaflets on the demonstrations and pickets. Three Unison strikers - Ingrid, Denise and Lynne Marie - spoke inspirationally at our post-strike rally meeting, alongside Brian Smith, branch secretary of Glasgow Unison and member of Socialist Party Scotland, and Philip Stott, our national secretary. We argued that the SNP, just like Labour before them, has no right to claim to be anti-austerity if they pass on Tory cuts, attack terms and conditions or refuse to implement equal pay schemes. Labour was thrown out of power in Glasgow and the same could happen to the SNP. We raised the demand that the Scottish government and Glasgow City Council meet the cost of equal pay, estimated to be up to £1 billion, and set fighting, no-cuts budgets that defy Tory austerity. The first 48-hour strike has had a massive industrial and political effect on Glasgow and beyond. The unions would be fully justified in escalating the action. If they did this it would drive further political conclusions, by raising the need for a genuine anti-austerity mass party that fights on socialist policies. It was fitting that this example of the power of the working class came just a few weeks before the 100th anniversary of the revolutionary events of 'Red Clydeside' in January 1919. History is being re-made. And it is working class women and men, allied to fighting socialist policies, that will make it. 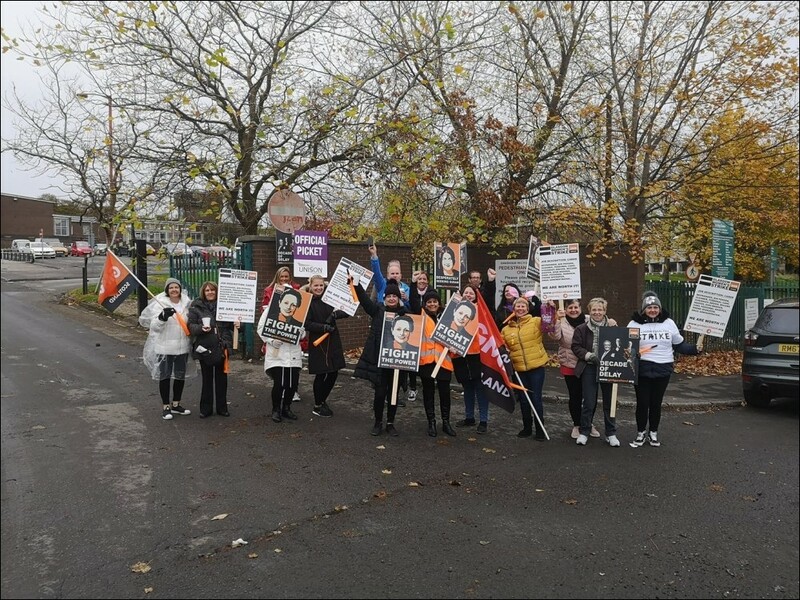 In a vindictive act, EIS teachers' union member Victoria Wainwright, a supply teacher, was told that she would never be able to work at her school again after taking solidarity action with the Glasgow strikers. "To me, it sounded quite threatening and like I was being blacklisted." Trade unionists must demand her reinstatement and the lifting of any blacklisting. An injury to one is an injury to all. On 27 October, 30,000 teachers and supporters marched in Glasgow as part of the pay campaign by the Educational Institute of Scotland (EIS) teaching union. The EIS is demanding a 10% rise - its members having suffered a 24% real cut in pay in the last decade.